Ruins of a large Biblical city, located at a junction of major ancient crossroads in the Jezreel valley. 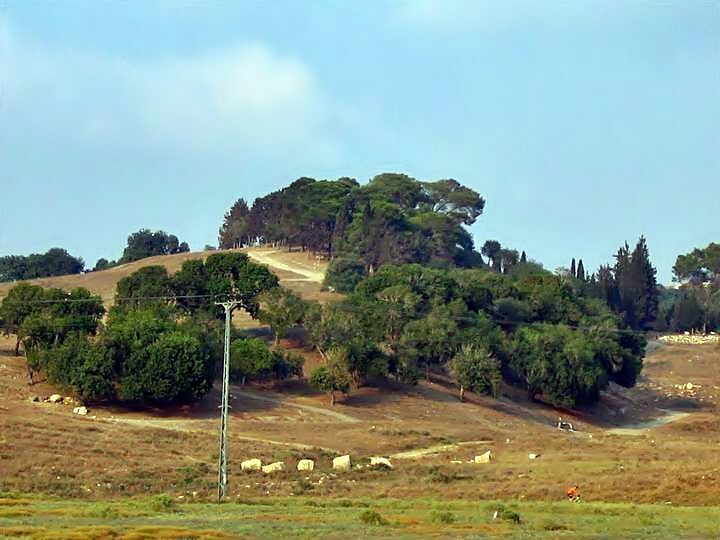 Joshua 12: 1, 20: "Now these are the kings of the land, whom the children of Israel smote, and possessed their land... the king of Shimron-meron, one;"
Tel Shimron is an ancient site with thousands of years of history. Today it is a park with an observation tower overlooking the valley. In its nearby cemetery there are several famous graves (such as General Moshe Dayan and Astronaut Ilan Ramon). An aerial map of Shimron is shown below, indicating the major points of interest. The height of the top of the hill is 185M, 85M above the Yizrael (Jezreel) valley around it. 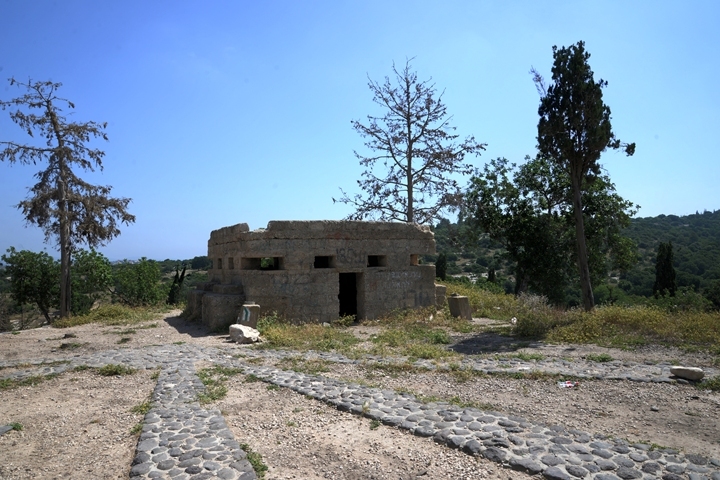 The area of the entire site is large - about 150 Dunam (15 hectares). Near the Tel there are 5 sources of waters (springs and wells) which was an important factor for the growth of the city in ancient times. 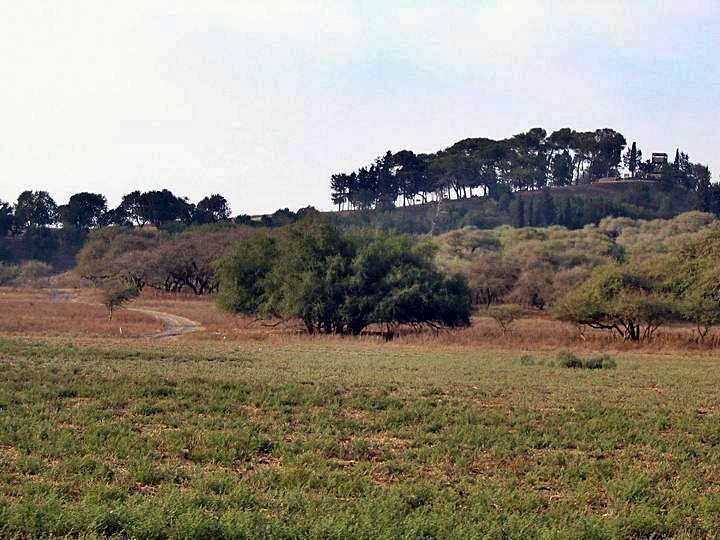 According to the Archaeological survey, Tel Shimron area was inhabited in the Chalcolithic period (4,500-3150BC). The city continued to be populated in the Early Bronze (3150-2200 BC), and especially in the middle Bronze (Caananite) period (2200-1550BC). In the late Bronze period (1550BC- 1200BC) the city expanded to the top. The top of the hill was built with a double Acropolis (one top above another top). A steep glacis was built around the top of the hill to protect it. Three wide levels were built around the top, with steep walls between the levels, which in some cases reached 20M height. The 19th C Egyptian (12th Dynasty) enemy-curse (execration) clay tablets list it as "Shim'on". It was one of the 64 places listed in the second group of tablets, which were aimed to bring disasters to the enemies of the Pharaohs. These inscriptions appear on small figures in the form of prisoners. Shimron was an important city in this period: It was mentioned in Amarna letters as "Shimron". This 14th century BC Egyptian archive of 350 small clay tablets was discovered in 1888 in the capital city of Akhet-Aten ("Horizon of the Sun"), 312km south of Cairo. This archive has two letters from the Governor of the city, Shemu-Ada, which addresses the Egyptian Pharaoh. 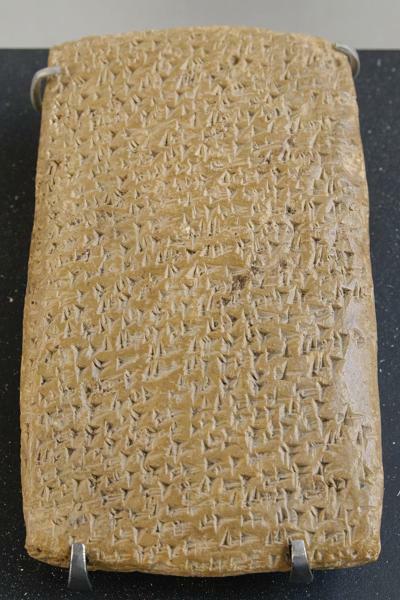 - Cuneiform writing on a clay tablet. North: through Acre or Netufa valley to Syria, Tyre, Sidon. There was also a paved Roman road to Sepphoris. South: through Yokneam or Megiddo towards the center of Israel and Egypt. This road was paved by the Romans to Legio (Roman Megiddo) and its route passes on the west side of the site - where the modern road to Zarzir exists today. 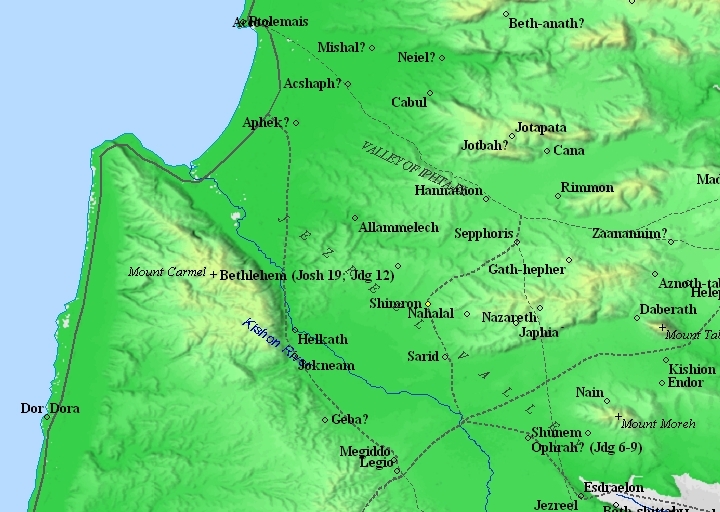 A Biblical map shows the position of the city in the center of the Jezreel valley (marked by a yellow circle), and the north-south Roman road passing near it. 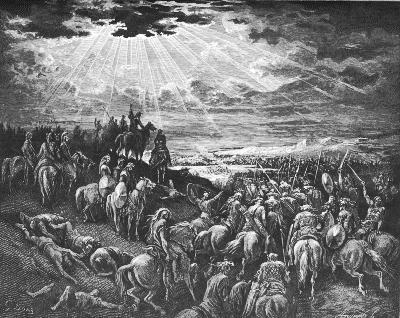 "And it came to pass, when Jabin king of Hazor heard thereof, that he sent to Jobab king of Madon, and to the king of Shimron, and to the king of Achshaph,... And all these kings met together, and they came and pitched together at the waters of Merom, to fight with Israel". "Now these are the kings of the land, whom the children of Israel smote, and possessed their land...the king of Shimron-meron, one; the king of Achshaph, one". "And the border turned about it on the north to Hannathon; and the goings out thereof were at the valley of Iphtahel; and Kattath, and Nahalal, and Shimron, and Idalah, and Beth-lehem; twelve cities with their villages. This is the inheritance of the children of Zebulun according to their families, these cities with their villages". Later, during the Second temple period, the Jewish town was called Simonia. The Jerusalem Talmud, a 3rd century compilation of Rabbinic notes on the Mishna, explained that the old name 'Shimron' changed at those times to Simonia (Megila page 2 , 2 1:1, Hebrew): "And Shimron - Simonia". The village flourished from the commercially strategic location until the Roman times. The town was spread over the hills around the Biblical Tel. The foundations of Simonia can be seen all over the area, including caves, cisterns, wine and oil presses, and quarrying sites. Until the beginning of the 20th century was a small Arab village was located at the site, on the basalt hill south east side of the mound. Its name, Semunieh, preserved the ancient name. A group of German Templars settled in Semunieh in the second half of the 19th century, but abandoned it. The area of was examined in the Palestine Exploration Foundation (PEF) survey (1866-1877) by Wilson, Conder and Kitchener. The map on the right is a section of their survey results. Notice the double-dashed line that passes near the Arab village of Semunieh, which was one of the main roads to Nazareth. "In 1867 a colony of about twelve Germans established itself at Semunieh, and endeavored to cultivate the plain, living in huts. They all fell ill, and died of fever". In 1921 Jewish settlers came to the nearby foothills in order to establish a new settlement. Shortly after they managed to dry out the marshlands with the deadly mosquitoes, the settlers relocated to the valley 2Km south of Shimron, where the modern Moshav of Nahalal is located today. 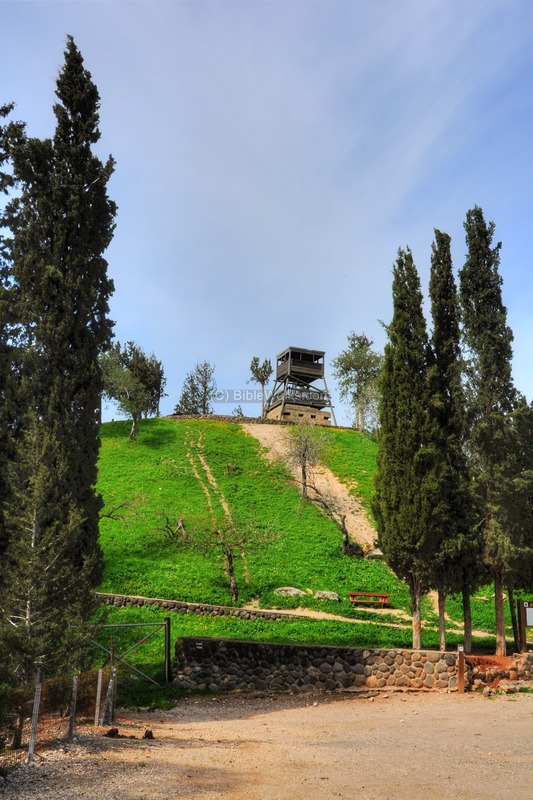 A cemetery on the south east side of the summit is still in use by the Nahalal residents, with famous people buried here such as the late General Moshe Dayan and Astronaut Ilan Ramon. After the independence of Israel dozens of temporary houses were erected on the west side, and their cement platforms are still visible there on the western slopes. The immigrants then relocated to a nearby new city, Migdal-Haemek. Nearby, on the north-east side, a new community settlement of Timrat has been established in the 1981. 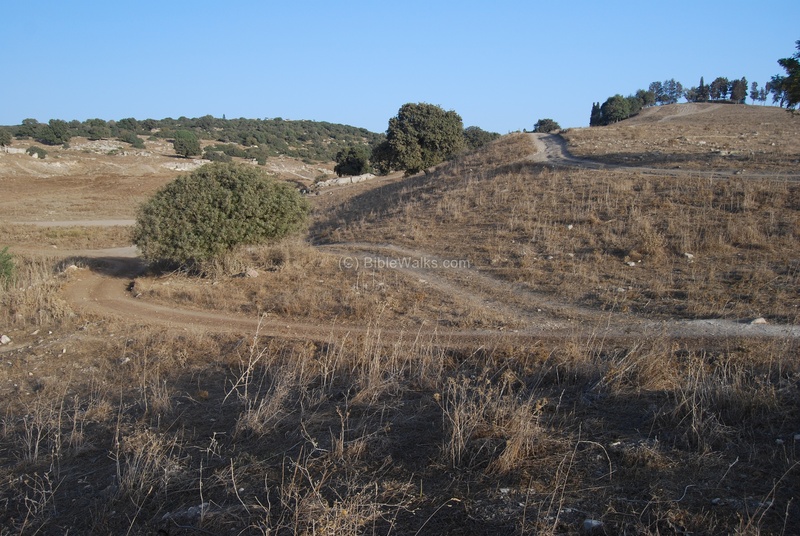 In July 2011 BibleWalks helped to discover a Roman period marking in Hebrew, with the letters "Sha-ba-t". It is located nearby in Timrat, within the range permitted for walking on a Sabbath. This was the first ancient Sabbath marking found in Hebrew in the Galilee. A drone captured this photo from the south west side. The ancient city occupied the entire hill, while the "upper city" was located on the summit. The white rectangles on the hillside are the foundations of the abandoned immigrant camp (Ma'abara). Its temporary residents were relocated in 1954 to the city of Migdal Haemek. The modern houses of Timrat are seen in the upper right background. Another drone view, from the north west side, is in the following photo. The fertile Jezreel valley can be seen on the right background. The following photo the view from the south, on the road to Nazareth. On the top of the steep hill, on the right side, there is an observation tower. This is the acropolis of the city. The 2 lower levels of the city are seen in the center and on the left. The views of the trees (white Acacia) in the foreground are unique and rare in this area and look like African prairie lands. On the western slopes, at the left, lies the ancient city. The cemetery is in the hidden right side, and the public access road passes from that side. You can drive up to the parking lot behind the cemetery. Another view from the south, during the winter time. The ruins of the upper city is seen in the center where the modern tower is located. The modern cemetery of Nahalal is seen on the right side. The following photo shows the Tel from the south-west side, from Nahallal junction. On this side there is an extension of the city on the slopes of the hill. The Bronze-age city was built with 3 levels: the acropolis (the top), the upper city (below the top), and the lower city (beyond the left side). In the left side of the front trees was the south entrance to the city, which led to the lower city. The city also had a second gate, on the north side of the hill. On the right side is the cemetery and the community settlement of Timrat. A closer detail of the ruins of the south gate is seen below, where the modern dirt road follows the path of the ancient gate. According to the survey, the length of the gate was 20M and its width was 6M, and it was based on columns on both sides. The large rough stones, seen in the photo, are part of the right wing of the gate which lies on the base of the high walls behind it, before the trees . The left wing of the gate was located along the bottom of the photo and is missing - it collapsed and fell down the slopes. Below it was a high wall that supported the south side of the entrance road. 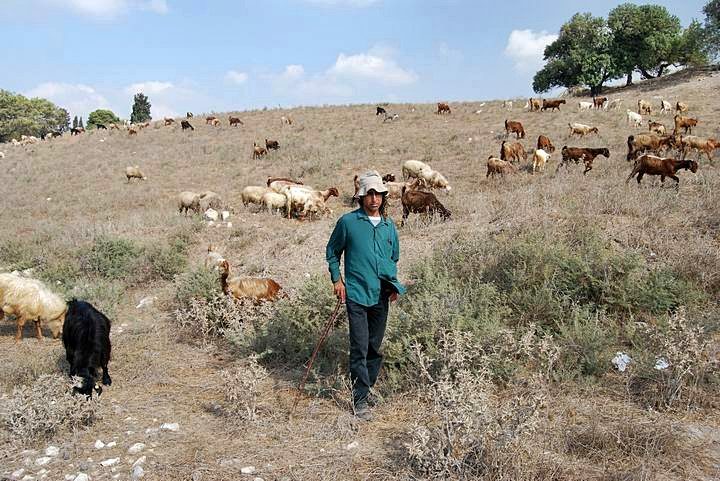 Khaled, the local Arab shepherd, is seen in the photo below with the herd of goats grazing along the hillside, below the place of the south gate - which is seen on the top right side. The top left side is the location of the Bronze-age lower city. Webmaster Rotem makes friends with the goats. The entire view of the south entrance behind her. The ancient road went up the hill from right to left, just below the tree line..
Another photo from the north-west, from the lower city. The top of the hill, above the "upper" city, is seen in the top center. The lower city is located on the right side. From this photo you can realize the large size of the site. The photo below shows the place of the north gate. The ancient entrance turned around at this point (from left to right, and up to the upper city on the right). This configuration is similar to the gate on the south side, and allowed the defenders to control the gate from the top. Another view of the north gate, taken from the north side. A shepherd (not the same from the south gate) is seen with a herd of goats . According to the shepherd, the small tree on top of the north gate, marked by green flags, is the place of the Arab cemetery and the tomb of a sheik. 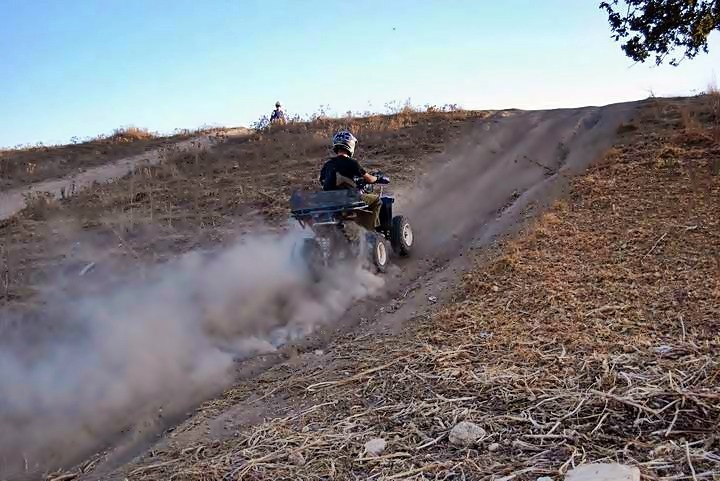 Also notice the traces of the motor bikes and all-terrain vehicles (ATVs), which enjoy the steep hillside which used to be the ancient north walls of the city. 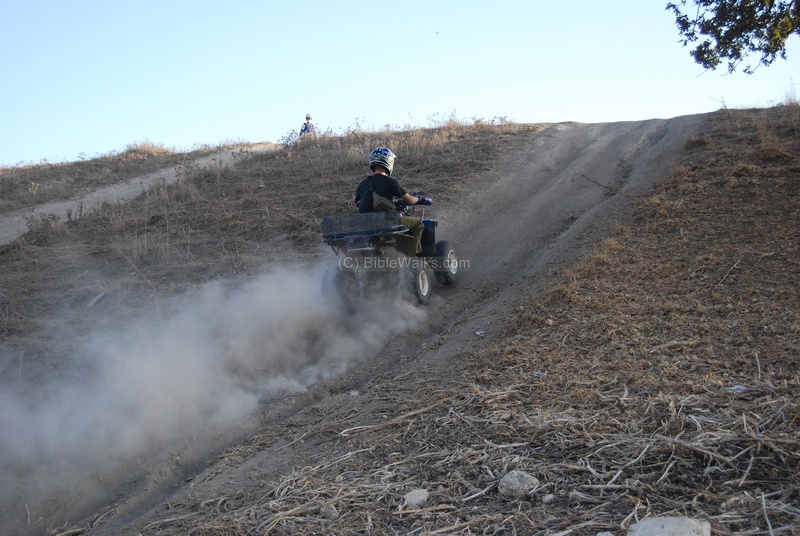 The photo below shows the biker shooting up his ATV up the northern walls. His friend, with a motor bike, is waiting on the top. You can also visit our extreme sports page for more photos at Biblical sites. On top of the hill was an observation tower, built of a base of a bunker. It offered great views of the area around Tel Shimron. A 360 degrees Panoramic view from the tower is shown below. If you press on this picture, a panoramic viewer will pop up. Using this flash-based panoramic viewer, you can move around left and right, zooming in and out, and view the site in full screen mode. Points of interest are indicated in the view. The viewer automatically rotates slowly around. Due to its large size, it may take minutes to upload... but its worth the view! A new excavation project started in 2016 with a complete survey of the site. The team is headed by Dr. Daniel M. Master and Dr. Mario Martin, and assisted by other professionals and volunteers. The first season included the use of ground penetrating radar to map the underground structures. A ceramics survey of all surfaces provided a map of the historical periods across Tel Shimron. 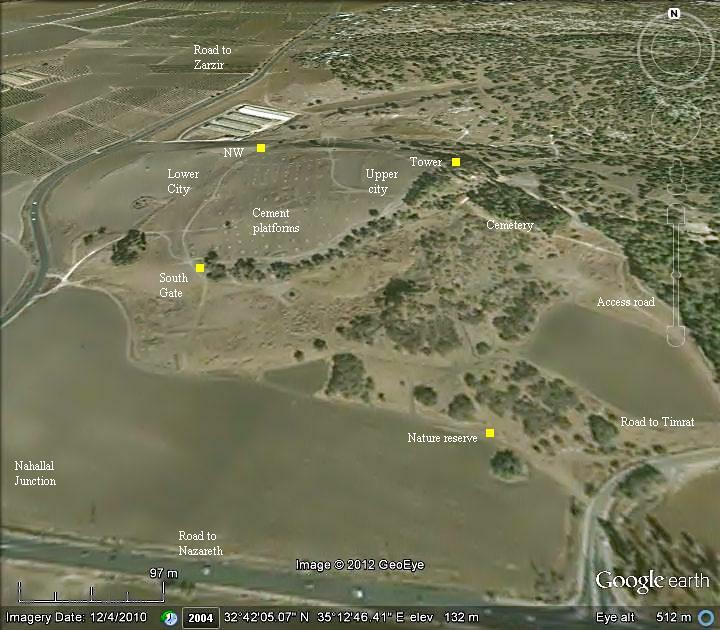 These inputs helped to compile a comprehensive survey report on Tel Shimron, which is used to plan the future excavations. The first digging team started to cut squares in June 2017. Three major areas are planned for 2017, focusing on the Middle Bronze (MB) areas- on the northern foothills (where the bikers used to shoot up the foothills), on the south west side (city walls and gate), and on the summit (the acropolis). "Now king Agrippa sent an army to make themselves masters of the citadel of Gamala, and over it Equieulus Modius; but the forces that were sent were not allow to encompass the citadel quite round, but lay before it in the open places, and besieged it. But when Ebutius the decurion, who was intrusted with the government of the great plain, heard that I was at Simonias, a village situated in the confines of Galilee, and was distant from him sixty furlongs, he took a hundred horsemen that were with him by night, and a certain number of footmen, about two hundred, and brought the inhabitants of the city Gibea along with him as auxiliaries, and marched in the night, and came to the village where I abode. Upon this I pitched my camp over against him, which had a great number of forces in it: but Ebutius tried to draw us down into the plain, as greatly depending upon his horsemen; but we would not come down; for when I was satisfied of the advantage that his horse would have if we came down into the plain, while we were all footmen, I resolved to join battle with the enemy where I was. Now Ebutius and his party made a courageous opposition for some time; but when he saw that his horse were useless to him in that place, he retired back to the city Gibea, having lost three of his men in the fight. ..."
The Canaanite name was Shimron. The name of the Jewish town in Roman times was Simonia, or Simon. This name may have been in honor of Simon the Maccabee or the tribe of Shimon. Josephus calls the place (see text above): Simonias. The Arabic name (Semunieh) kept the Jewish name. It is shon on the PEF map. Mahlul (Maalul)- ruined Arabic village about 2KM east. The site is in ruins from 1948, and only 2 Churches remain intact but closed. The site may be reached on foot. The site is identified as ancient Nahalal. Migdal Haemek - the city is located 3 KM SE. There are here a few remains from the Roman and Arabic village, but the old Churches remained intact and can be visited.